Today, energy companies are using drones to capture data that was previously dangerous, difficult, or expensive to obtain. But what is drone data, exactly? And what’s the benefit of this new treasure trove of data? Measure has delivered drone data to a wide range of clients across the energy industry, including more than 1GW of solar inspection data, 2.5GW of wind turbines, 400 utility poles and towers, and countless acres of thermal generation plants and construction sites. Yes, that is a LOT of data. But let's take a look at what that means and what it looks like in its usable form. Processed. Hundreds or even thousands of images are identified, arranged, and /or stitched together to create an organized, usable, and cohesive data set. Measured. Drone data is often processed into data products that can be accurately geolocated and/or measured, similar to a map or computer model. Thermal imagery also enables temperature measurements. Analyzed. With drone data, you can derive insights like classifying the severity of damage on a wind turbine blade, the degree of degradation of insulators, and whether solar panel damage is at the string, module, or sub-module level. Tracked. Collecting data over time can show everything from progress on a construction site to the rate of increasing severity of turbine blade defects or the amount of material usage in a stockpile. Compared. Owners of multiple energy assets can learn a lot by comparing data sets across their own sites, with other similar data sets, or against plans. Are turbines from a particular manufacturer performing better or worse than others? Does my solar plant under construction match the site plan? Drone data is also driving advancements in artificial intelligence and predictive analytics. Very large sets of aggregated drone data will allow us to, for example, better predict when your Class 3 wind turbine blade damage will progress to a Class 4. Instead of scheduling inspections and maintenance according to a common schedule, you’ll be able to optimize based on a more detailed set of site and environmental conditions. Drone data will not only give you insights on your energy and infrastructure assets today, but also provide a look into the future. 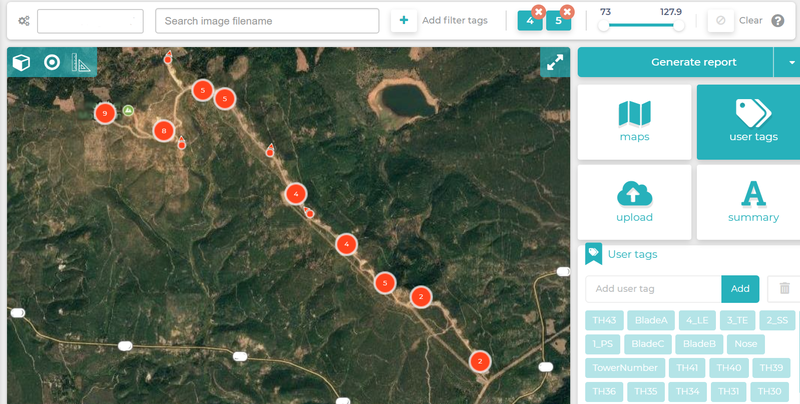 Ultimately, drone data is used to create a drone data product. The relevant data product will depend on your particular use case. The variety of data products reflects the wide range of possible use cases. So, how does this data benefit your business? Energy company AES estimates that their drone program saves 30,000 hazardous man-hours each year. That’s time not spent climbing poles, using bucket trucks, traversing difficult terrain, or exposed to extreme temperatures. Measure’s analysis of several solar inspections showed a 97% improvement in inspection time efficiency. Drones collect data faster than manual methods, while reducing risks to workers. Screen shot of an interactive web map for a solar inspection. View comparison of real results across four solar farms: Download Solar Case Study. To test the accuracy of Measure’s drone inspection data, we conducted an experiment. We took the results of a solar inspection by drone and sent out manual inspection crews to run the same inspection on the same plants. The results the crews came back with from the manual inspection mirrored the results from the drone data with 99 percent accuracy, but the manual inspection took two days for each site compared to two hours with the drone. In Wind and Transmission & Distribution (T&D) applications, drones can capture close-up, detailed imagery of potential defects that enable maintenance personnel to really see what’s going on – is the apparent damage at the surface level, or is it structural? Drones can also capture tower, pole, and turbine images from most any angle, which is often not possible with other inspection methods. In solar applications, drones spot sub-module defects that manual inspections typically miss. These improvements help asset managers make better decisions about needed repairs, thus optimizing their maintenance budgets and minimizing downtime. Screen shots of an interactive web portal for a wind inspection. For more data output examples, download the full paper. Unlike manual inspection data which generally sits inside an inspector's head or lives in a spreadsheet somewhere, drone data can be manipulated and analyzed from different angles. For example, with a single drone mission, you can get a clear understanding of the shading conditions of a solar site at any time of the year. During construction, you can overlay actual construction progress imagery with site plans to gauge whether construction is proceeding according to specifications. For the amount of data that is processed with a typical inspection (e.g. 300 images or 3GB per wind turbine), reading and consuming the information is surprisingly easy. Data can even be delivered through a smart phone app, allowing field maintenance personnel to proceed directly to the location of identified defects. What many find to be the most valuable part of drone data is that it is documented and lives forever. This allows energy plants to perform year-over-year analysis and gives operations the ability to reference prior inspection data to make smart decisions about future work. Asset managers can even compare the health of equipment across multiple sites. Documentation is especially relevant where employee turnover is prevalent. In developing industries such as Wind and Solar, the employee who performed the inspection in years prior may not still be with the company by the next time an inspection is required. With drone data, you don’t have to reference a person, only a database, to know what the last inspection picked up. For more information on how to use drone data to improve energy operations, download the complete paper Putting Drone Data to Work in Energy Operations.